Station for today’s Mass is at St. Stephen’s Church on the Cœlian Hill in Rome. The Jewish origin of Saint Stephen is universally acknowledged; he is known and loved everywhere as the first follower of Christ to give to his martyred God love for love, blood for blood. It is not certain whether he was among the seventy-two disciples of Jesus; some believe he was of the Greek tongue and not a native of Palestine. He studied with Saint Paul and Saint Barnabas under the famous Doctor of the Law, Gamaliel, who, being a member of the Sanhedrin, attempted to stop the persecution of the Apostles. (Acts of the Apostles 5:34-40) What is certain, however, is that he distinguished himself among his brethren as an admirable Christian, replete with the gifts of the Holy Spirit. To his great beauty and angelic chastity were joined humility, patience, gentleness and charity, so perfect that they drew from all the faithful great admiration and esteem for him. Saint Stephen died, beholding his Lord standing at the right hand of God. He imitated Him in death; crying out, “Lord Jesus, receive my spirit!” He concluded on his knees, “Lord, do not impute to them this sin!” And then he fell asleep, the narrative says. His mortal remains were left outdoors to be devoured by beasts, but were protected by God; and Gamaliel, the Doctor of the Law, took the body of the martyr to his own country home, a few leagues from the city, where he buried him. His tomb was discovered miraculously in the fifth century, by the intervention of Gamaliel himself in a priest’s dream. The greater part of his relics are still conserved in the Basilica of Saint Lawrence and Saint Stephen in Rome. His death was the signal for a great persecution of the Christians in Jerusalem, spurred on by Saul, who had approved his death. But Saint John Chrysostom remarks that because Stephen prayed, we have Saint Paul, whose conversion miraculously came about soon afterwards. For princes sat, and spoke against me: but thy servant was employed in thy justifications. All thy statutes are truth: they have persecuted me unjustly, do thou help me. (Ps. 118: 1) Blessed are the undefiled in the way, who walk in the law of the Lord. v. Glory be to the Father and to the Son and to the Holy Ghost, as it was in the beginning, is now and ever shall be, world without end. Amen. And Stephen, full of grace and fortitude, did great wonders and signs among the people. Now there arose some, of that which is called the synagogue of the Libertines and of the Cyrenians and of the Alexandrians and of them that were of Cilicia and Asia, disputing with Stephen. And they were not able to resist the wisdom and the spirit that spoke. Now hearing these things, they were cut to the heart: and they gnashed with their teeth at him. But he, being full of the Holy Ghost, looking up steadfastly to heaven, saw the glory of God and Jesus standing on the right hand of God. And he said: Behold, I see the heavens opened and the Son of man standing on the right hand of God. And they, crying out with a loud voice, stopped their ears and with one accord ran violently upon him. And casting him forth without the city. they stoned him. And the witnesses laid down their garments at the feet of a young man, whose name was Saul. 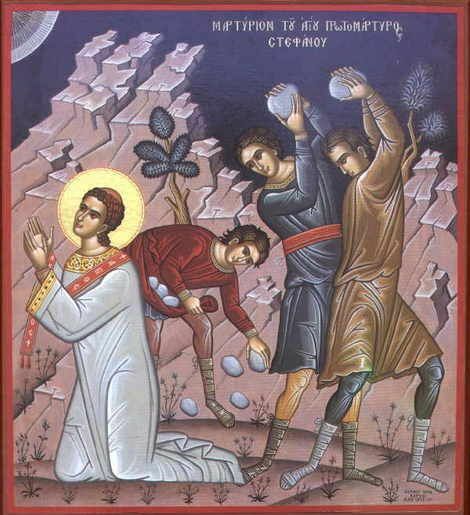 And they stoned Stephen, invoking and saying: Lord Jesus, receive my spirit. And falling on his knees, he cried with a loud voice, saying: Lord, lay not his sin to their charge: And when he had said this, he fell asleep in the Lord. Princes sat, and spoke against me: and the wicked persecuted me. V. Help me, O Lord my God: save me for Thy mercy’s sake. Alleluia, alleluia. V. (Acts 7: 56) I see the Heavens opened, and Jesus standing on the right hand of the power of God. Alleluia. The Apostles chose Stephen to be a levitek, a man full of faith and of the Holy Ghost: whom the Jews stoned, invoking and saying: Lord Jesus, receive my spirit, alleluia. Grant, we beseech Thee, almighty God, that as the Savior of the world, born on this day, is the Author of our heavenly birth, so He may also be to us the Giver of immortality. Through the same Lord Jesus Christ, Thy Son, Who liveth and reigneth with Thee in the unity of the Holy Ghost, one God Forever and ever.